PDF in Snow Leopard’s Preview? Maybe Not. I just installed Apple’s latest Snow Leopard operating system (OS X 10.6), and headed straight for the updated Preview utility, which now claims the ability to annotate PDFs, a key feature of Adobe’s flagship Acrobat software. I opened a PDF into Preview, tapped the new Annotate button, and was rewarded by a slight shrinking of the visible page. Glancing down, I noticed a tiny row of buttons now lurking at the bottom of the Preview window. Some of the buttons add annotations. Others modify selected annotations. It’s neatly done, but a bit too subtle, and heavy on mouse-travel. The ability to annotate PDFs is obviously a great idea, but in the latest Preview, the implementation isn’t all it could be. Preview’s annotations often look quite different compared to Adobe’s annotations, and not in a good way. Part of what users expect from PDF is the quality of sameness, wherever the file is viewed or printed. If annotations differ significantly from Adobe’s version, that quality is diminished. Apple needs to spend more energy on improving their annotation appearances. When will Apple get with the Program? A larger issue is Apple’s choice of PDF version. Eschewing ISO 32000, the current PDF Standard, Apple’s Preview causes PDFs to self-identify as version 1.3, which dates from 2000. This trashes PDF files that depend upon features added since the 1.3 version of the PDF Reference. 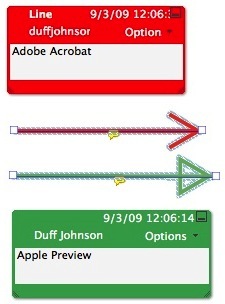 Example: After annotating and saving a digitally-signed PDF using Preview, I reopened it in Acrobat. The signature had vanished, along with the digital signature field itself. Not Good. Conclusion: Preview is a pretty “rough” handler of PDFs. If you choose Preview to do anything other than view your PDF files, just remember that you get what you pay for.